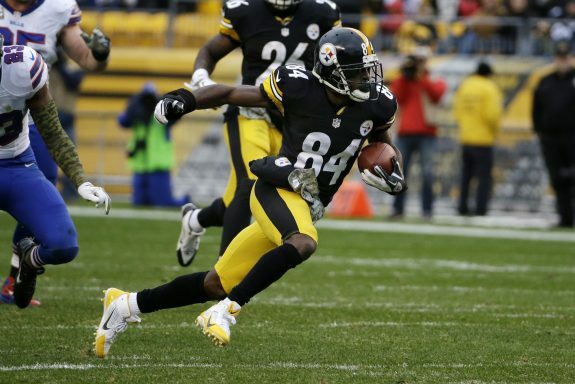 If you play Fantasy Football and had Steelers wide out Antonio Brown on your team this season, more than likely you liked what you saw from the Steelers big play wide out. Saturday, Brown was named the 2015 NFL.com Fantasy Player of the Year at the NFL Honors presentation on CBS. The show has become the Academy Awards of the NFL, where awards are given for things like the NFL MVP (Cam Newton of the Panthers) and football players look rather uncomfortable in tuxedos less than 24 hours before the Super Bowl. Nevertheless, Brown snagged the best fantasy player award after another amazing season for the Steelers in which he caught 136 passes. He also became the first player in Steelers’ history with back-to-back seasons with at least 1,700 yards from scrimmage. Some fantasy experts are saying Brown should be the first overall pick in your fantasy draft for 2016. After seeing what he did in 2015, that’s not that far fetched. 1 Comment on "Steelers WR Antonio Brown Wins the Fantasy Player of the Year Award"
Congrats to Brown , its not a surprise with his talent . On another note , congrats to Kevin Greene and the rest of the 2016 Hall of Fame class . Kevin was one helluva linebacker . Whats truly sad is a player like Ken Stabler never got to see his induction after passing away last year . Stabler should have been elected years ago and its sad that less than a year after he passes , he finally got his call . One last comment . Another year passes and steelers great L.C. Greenwood is left off the ballot . It makes no sense and like Stabler its sad that Greenwood passed and left this earth without ever getting his call to Canton . Had he played for any other team other than the Steelers , he probably would have been in ten or fifteen years ago . His misfortune was he played opposite of Joe Greene and on a team that had nine hall of famers playing at one time and he simply fell through the cracks . L.C. was every bit as dominant as the others and its unfair that hes never took his rightful place in Canton . Maybe one day , he will .